Why be a Catholic? Why bother? Is it about being a good person? Or fitting into a family, a culture, or a particular group of people? What exactly is the point of practicing the Catholic Faith? It might not be obvious at first, but these basic questions are addressed in today’s Gospel reading and in this celebration of the Feast of the Baptism of the Lord. They are answered, in part, when we consider another question, a question posed by this Feast: Why was Jesus baptized? If, after all, baptism is for the remission of sins, why would the sinless, holy Son of God insist he go under the waters of baptism? Not surprisingly, many of the Church Fathers contemplated this question. They recognized that God, in becoming man, had made a startling, transforming statement—through the Word—about the material world. All that has been created is good, and good things such as water, oil, bread, and wine will be used by God to bring grace and impart divine life. God did not become man, in other words, to merely make man more moral, or to help people get along better. “In his Son and through him,” states the first paragraph of the Catechism, God “invites men to become, in the Holy Spirit, his adopted children and thus heirs of his blessed life.” This is the message of Christmas, as described so pithily by St. Paul: “But when the fullness of time had come, God sent his Son, born of a woman, born under the law, to ransom those under the law, so that we might receive adoption” (Gal. 4:4-5). 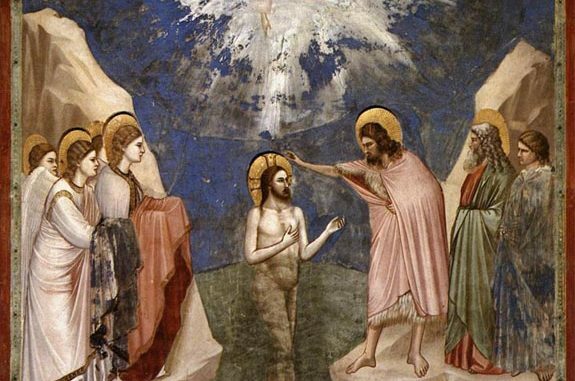 The Holy Spirit descended at the baptism of Christ and revealed the Trinity; he also disclosed the sanctifying work brought to man by the Incarnation, and by the death and resurrection of the Son. “The Spirit is the one who testifies,” St. John writes in today’s epistle, “and the Spirit is truth.” There are, he noted, three that testify: the Spirit, the water, and the blood. These three “are of one accord,” for they testify to the truth and to the One who is the Truth, the Way, and the Life. All three are necessary for true baptism: the Holy Spirit fills man with new life, the water signifies the destruction of original sin and the infusion of divine life, and the blood of Christ regenerates man and restores his communion with God. Later in the Gospel of Mark, Jesus identified his baptism with his approaching death on the Cross: “You do not know what you are asking,” he said to James and John, “Can you drink the cup that I drink or be baptized with the baptism with which I am baptized?” When they insisted on being able, Jesus replied, “The cup that I drink, you will drink, and with the baptism with which I am baptized, you will be baptized” (Mk 10:38-39). Only through the death of Christ can we be baptized; only by baptism can we share in his life (cf. Rom 6:1-11). John’s baptism of water brought repentance, but more was needed. “So then John,” explained St. Ambrose, “who was a type of the law, came baptizing for repentance, while Christ came to offer grace.” That grace, which is the love and life of the Father, Son, and Holy Spirit, makes man holy. It makes man a son of God. That’s why we are Catholic. Does Religion Really Have a “Smart-People Problem”?